one + four = Required Please enter the correct value. There are a lot of moving parts to the gold story so let's start with the biggest takeaway: Gold prices are facing only a temporary setback. Longer-term, as the U.S. Federal Reserve and other central banks begin to wind down quantitative easing and, more importantly, begin to ease interest rates back up to more "normal" levels, inflation should begin to kick in and drive gold up to new highs, making the yellow metal a great long-term investment. First, though, let's tease apart the various factors that currently are driving the price of gold lower. The Federal Open Market Committee is beginning to consider the timing of the end of quantitative easing. The most recent FOMC meeting explored the idea of ending quantitative easing but keeping the Fed funds rate between zero and 0.25% until unemployment falls below 6.5% and as long as inflation remains below 2.5%. But the markets are expecting long-term rates to rise when the Fed stops buying Treasury bonds through its asset-purchasing (quantitative easing) program. The market is assuming that the Fed's purchases are keeping long-term interest rates artificially low. Once those purchases stop, it is reasoned that long-term rates will rise to where they would be if the Fed had done nothing. As a result, the yield curve has steepened with 10-year rates now over 2.0% and 30-year bonds yielding 3.19%. Although the yield curve has steepened, it is not really discounting any inflationary expectations. That is especially true, given the looming budget sequester next week. Yields on 10-year Treasury Inflation-Protected Securities (TIPS) are still negative while 30-year TIPS offer a whopping 0.6% annual, inflation-adjusted yield. Perhaps gold prices are telling us that since the market is not anticipating inflation for the next 30 years, there is no real point in owning gold as an inflation hedge. Although the gold chart is more of a symptom than a cause, gold has broken below just about all of its major supports on the daily chart. You can also look at the SPDR Gold Trust (NYSE: GLD). GLD's price has fallen below its 500-day simple moving average for the first time since Oct. 22, 2008, at the height of the financial crisis. GLD traded below the 500-day simple moving average until Dec. 9, 2008, and never touched that moving average again until Feb. 11, 2013. Much has been made of the fact that, in the next day or two, GLD's 50-day simple moving average and the 200-day simple moving average will form a death cross (when the 50-day moving average crosses below the 200-day moving average and both are moving lower) but this is simply a confirmation that GLD is in a down trend. That has been evident since the 50-day simple moving average peaked back on Nov. 23, 2012. What's more important is that there's support for GLD around the 150 level, which held twice during 2012. If that fails, then the next support level would be at the 200-week simple moving average, currently 137.46 and rising. The chart is ugly to be sure, but it isn't game-over for GLD. Perhaps the most likely cause of the recent weakness in gold prices comes from the unusual relationship between the spot gold price and gold futures. When traders buy gold futures, unless they want to take delivery of physical gold, they must sell expiring futures contracts and roll their positions out to a later month. Typically, as a near contract approaches expiry, it will trade at a discount to the spot price as selling reaches a climax. This is happening right now to the February contract and there is nothing unusual about that. What is unusual is that the April contract, where there is no pressure from expiration, went into backwardation Friday. This means that you can make a profit by selling spot gold today and buying a contract to receive delivery of gold in April. But, according to Keith Weiner, writing for Monetary Metals LLC, what is really strange about this is that the open interest in the April gold contract is rising, which should be pushing the price of the April contract higher. Weiner suggests that there is a large long silver/short gold arbitrage position out there. If that is true, the arb is getting killed as the gold/silver ratio has risen by 4.3% since the end of January. In other words, as fast as the gold price has fallen, silver has fallen even faster. We remain positive on the long-term outlook for gold prices. As mentioned above, higher long-term bond yields and the end of QE will not necessarily result in inflation. Even though it sounds counterintuitive, inflation is being held in check by zero interest rates. Once the Fed starts to raise interest rates back toward "normal" levels, that's when we will begin to see the inflationary impact of all the QE that has been dumped into the market. In the absence of inflation, we turn to the chart. 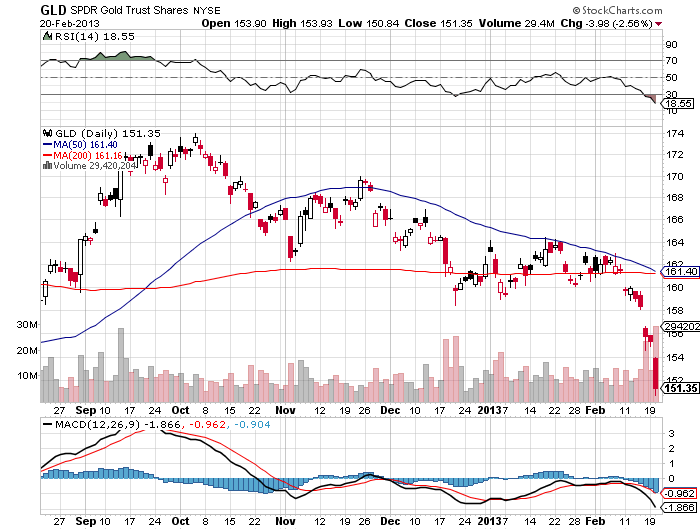 There is strong support for GLD around $150. That seems to be a good entry point for a long-term rally in gold prices. Gold prices were trading at $1,567.50 an ounce in New York Wednesday afternoon. Check out our 2013 Guide to Investing in Gold. Want to know more about gold prices and how to profit from them in 2013? Bill Patalon frequently updates his readers on how to play to gold in his Private Briefing investment service. 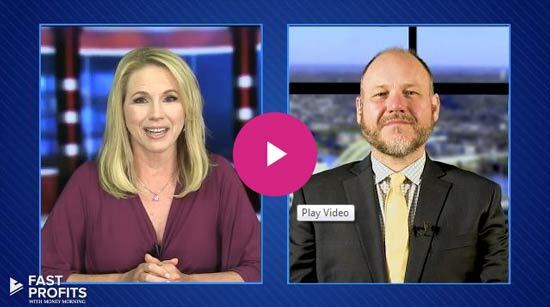 Find out how to get in the loop here. Yes.Gold is a totally useless brittle yellow substance and being given undue respect in SAARC and SSA region which is not even having basic meaningful infrastructure . Gold as a tool against inflation and being superior over paper currency are totally wrong as gold production of say 250 billion dollar a year can not support world economy which is threatening to reach 1 lac billion dollars. Countries like SAARC should prefer steel and cement and not the bullion as they have to invest trillions of dollars to improve their nonexistaent infrastructure of food, health energy , water, transport , education and shelter first for their entire population .SAARCians and SSAfricans will do well to improve them rather than madly running after bullion, oil and gas, aviation and electronics.We have miles to go for developing meaningful , long lasting , sustainable and affordable infrastructure.Poor nations should recognize their limitation and act accordingly. Are you serious, or jesting? Gold is not brittle, it is one of the most malleable materials known. Ever heard of gold leaf? Infrastructure is certainly needed. Where does a nation get the money to pay for infrastructure? SAARC has many natural resources that can be traded to other nations for money and / or materials to build infrastructure. SAARC obviously has much technology. It appears to me they have unresolved social problems that are impeding their peoples. Don't quibble! Similarly, don't be a literalist either. Both equal JERK ! Has it occurred to anyone else that our own government is manipulating the gold price by siphoning a lot of the panic sales? After all, Germany has repatriated its gold (a process which begins now and completes in seven years). IF the U.S. has misappropriated any of the bars and bullion stored here by other countries, then such a recall of the precious metal would come as a danger signal, and the government would want to recoup its indebtedness by driving the price down and buying what investors are selling in order to satisfy Germany and any other countries. I don't know what I'm talking about here, but the sudden downturn in gold prices is surprising in view of national debt problems. This leads to conjecture. Could you please explain why inflation will kick in when interest rates starts to increase? As you say, it does not make any sense. Why would inflation increase when higher interest rates decreases spending and increases savings? …I'm of the view the gold price is being supressed in order goverments can buy it up….give it a couple of years they'll release it and it will spring (2000+)…a nice this 30% return on a couple of years thank you very much!